We document the living history of NEC's video game consoles (TurboGrafx-16, PC-Engine, DUO, PC-FX, SuperGrafx). 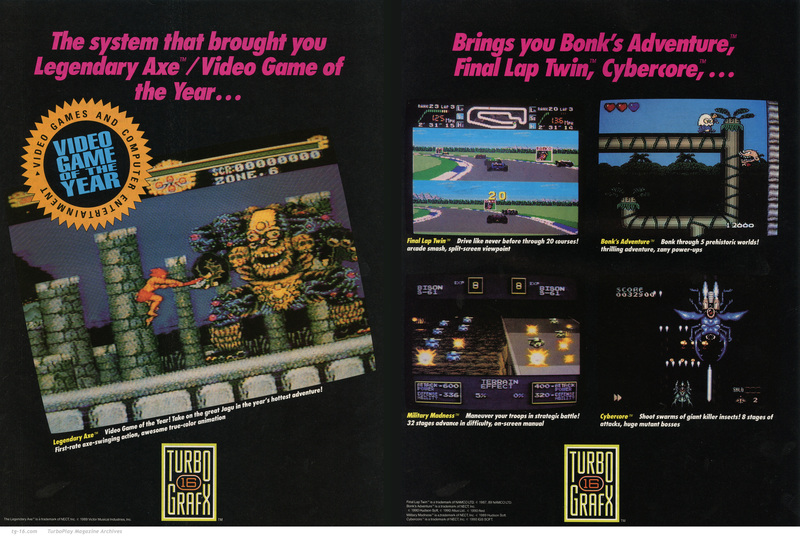 TurboPlay, DuoWorld and TurboForce were magazines that exclusively covered the TurboGrafx-16 / TurboDuo video game consoles. At the Archives, you can view page scans of articles, reviews, and advertisements printed in the magazines, newsletters and catalogs of yesteryear. Everything you ever wanted to know about Hudson Soft's classic turn-based strategy game awaits you. Over the past 20+ years, this humble strategy game has appeared on many different platforms (e.g. iPhone, iPad, XBLA, PSN, Wii Virtual Console, Gameboy, PlayStation, PC DOS, Windows 95, NEC's PC-98, Sharp's X68000, PC-Engine, DUO, TurboGrafx-16, Mobile Phones) and has inspired other games (Earth Light on SNES and Battle Isle on PC). The TurboPlay Magazine Archives are finally getting new content because fellow Turbo fans (thank you henrycsc, bernie, SuperPlay, akamichi, jelloslug!) have scanned hundreds of pages and collectively resussitated a long-dormant site. Direct links to the new page scans are below. The good news is that searching the TG-16 Magazine Database will produce increasingly robust results as new entries are added. NOTE: Database updates may lag behind this page. Be patient. TG-16 advertisement (EGM, August 1989). Look closely at the the HuCARD's pictured on the final page. These HuCARD's (Victory Run and Legendary Axe) are mock-ups: fancy coverart like this would not appear on actual cards for years. ALSO, in the mock-up, the text for Legendary Axe is outlined in black (making the title significantly easier to read than the muddy design that ultimately went into production). Finding these minor things is one of the reasons why I enjoy reading/archiving old print. TG-16 Preview (VG&CE, July 1989. Cover, 18-20, 22). Launch titles include: Alien Crush, Kato & Ken (re-titled J.J. & Jeff), Power Golf, World Class Baseball, R-Type, Victory Run and Vigilante. And, lest we forget the pack-in game: Keith Courage in Alpha Zones. I suspect that Deep Blue and China Warrior (not mentioned in article) were also available at launch. Can anyone confirm this? TurboExpress Preview (VG&CE, July 1990. Cover, 56-58). Author: Andy Eddy. TurboExpress is frequently referred to as "TGP" (TurboGrafx Portable) for want of a better name. Ha! NOTE: PC Genjin (Bonk's Adventure) is in the TGP's (ha!) 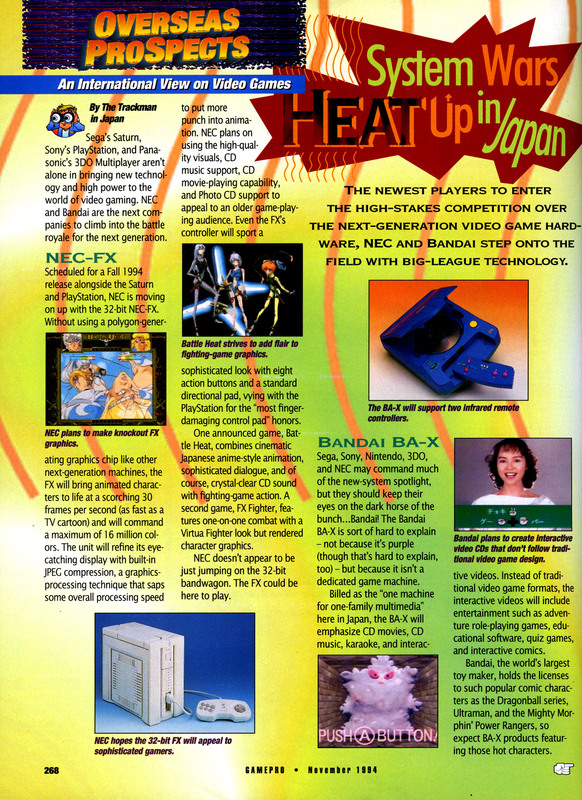 HuCARD slot—PC Genjin was the game most frequently used in promotional material for the TurboExpress. Excellent Holiday Catalog (CAPTRON / G&G Stores, 1993). An allusion to Bill and Ted, perhaps? The cover of this brochure proudly commands you to "Look for cool holiday coupons inside!" 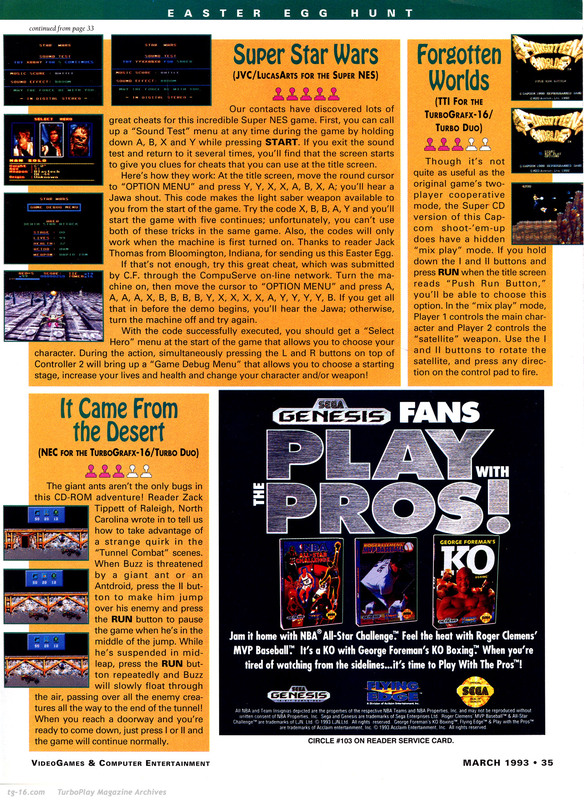 and, sure enough, even TurboGrafx-16 fans got a bit of love on page 11: "$3.00 OFF any featured 16-bit TTi title (with this coupon)." Only two games—Dungeon Explorer II and Madden Football—are shown (no prices listed). The TurboDuo console itself is priced at $299.99. 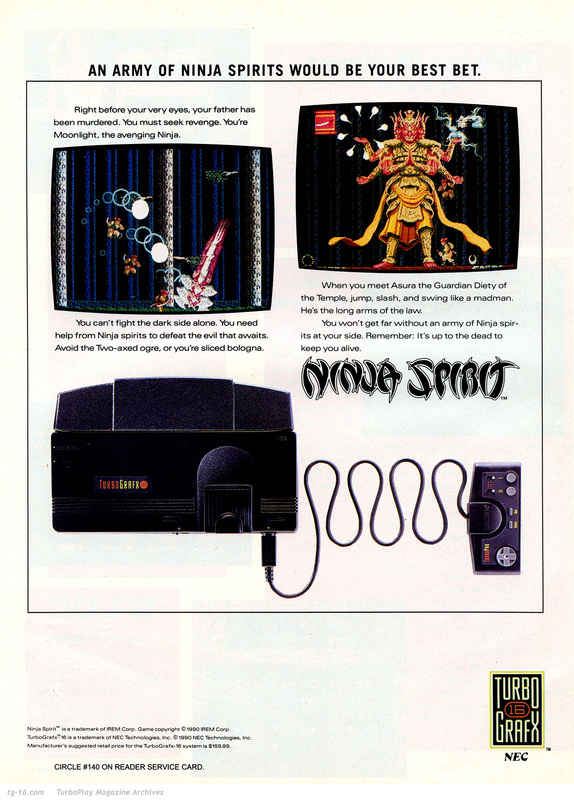 Ninja Spirit (HuCard) Advertisement (VG&CE, 1991). "Remember: It's up to the dead to keep you alive." The ad copy is, thankfully, kept to a minimum (does anyone ever read that drivel?). The only worthwhile aspect of this advertisemment: rather large screenshots (which, as I've written elsewhere), were not commonly found in marketing/packaging of the day. 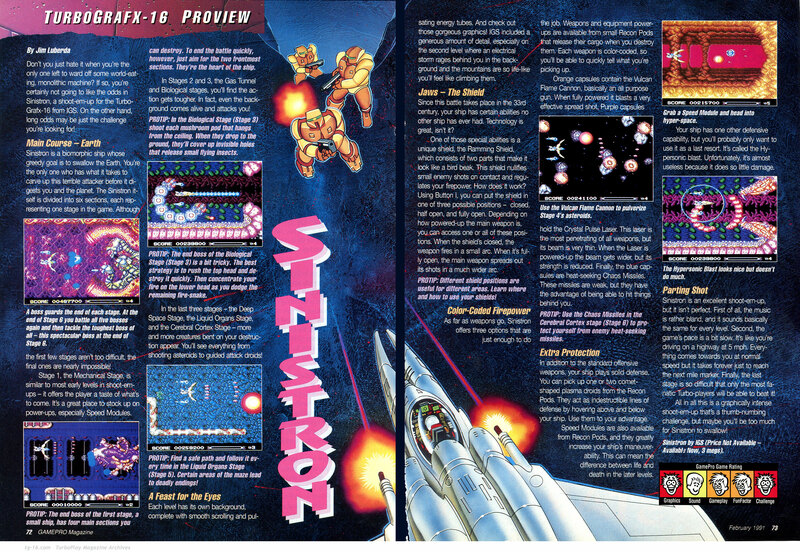 Sinistron (HuCard) Review (GamePro, 1991). "Sinistron is an excellent shoot-em-up, but it isn't perfect. First of all, the music is rather bland, and it sounds basically the same for every level. Second, the game's pace is a bit slow...Finally, the last stage is so difficult, that only the most fantatic Turbo-players will be able to beat it." This criticism (concerning the pacing) has been levelled at the Gradius series as well. In both games, the sluggish ship can be remedied by grabbing a speedup (or two). PC-FX Hardware (Next Generation, 1995). Oddly, PC-FX hardware is not pictured. A North American TurboDuo console is pictured instead. 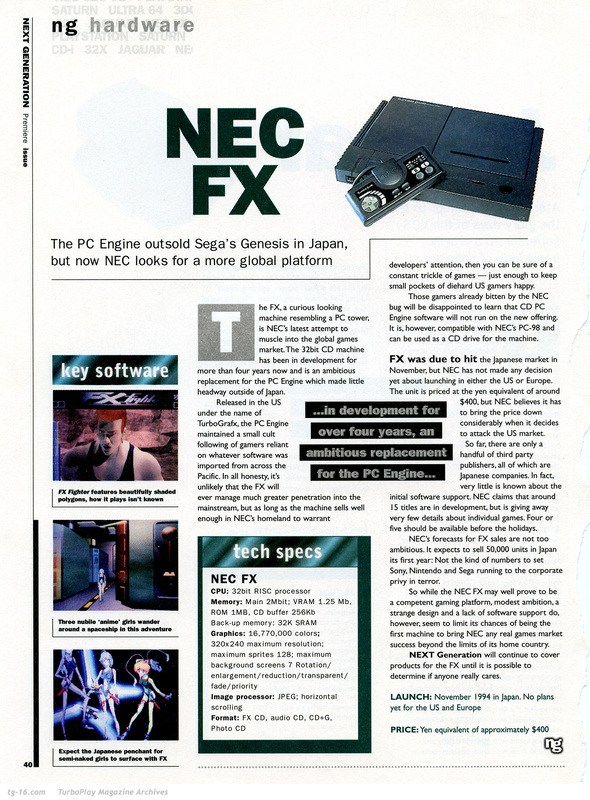 Also: "NEC's forecasts for PC-FX sales are not too ambitious. 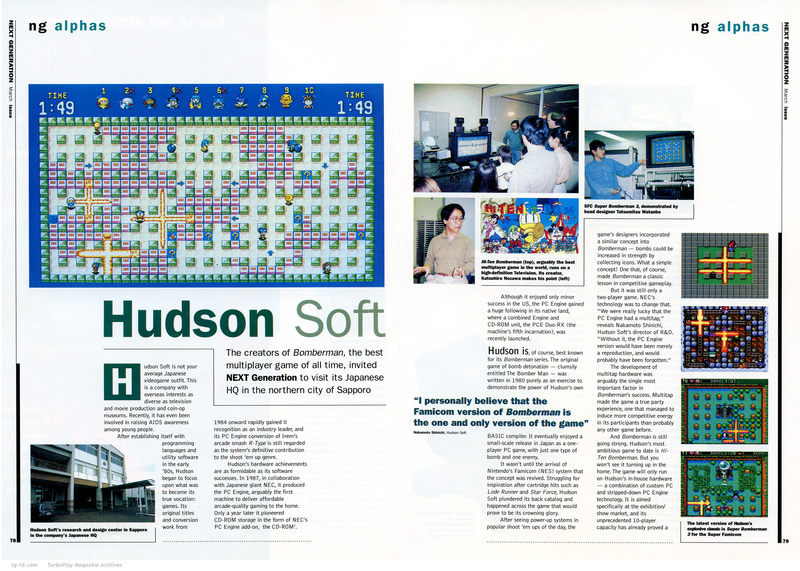 It expects to sell 50,000 units in Japan its first year.…"
Hudson Soft PT 1 (Next Generation, 1995). 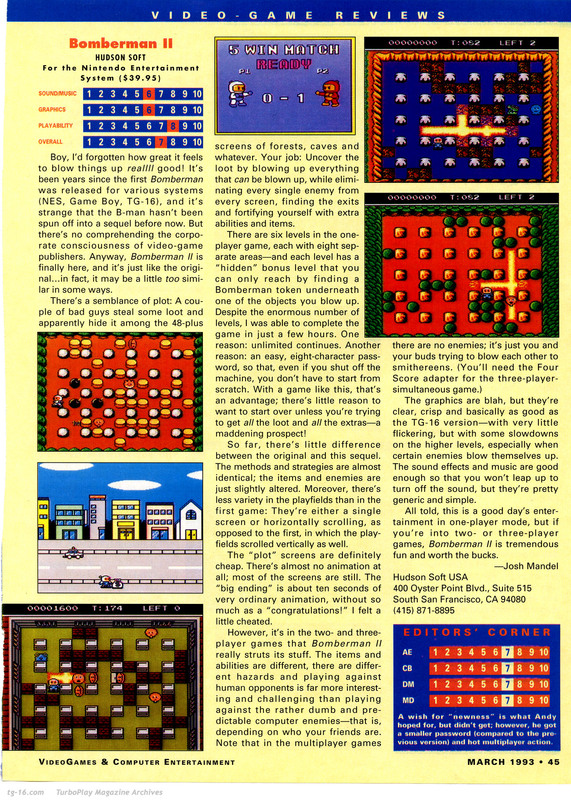 Hi-Ten Bomberman was the first video game designed (or, more precisely, released?) specifically for HDTV (can anyone verify this claim?). Also: "The game will only run on Hudson's in-house hardware—a combination of custom PC and stripped-down PC Engine technology. It is aimed specifically at the exhibition/show market…"
Hudson Soft PT 2 (Next Generation, 1995). Forget about the PC-FX. Nakamoto Shinichi, Hudson Soft's Director of R&D: "I personally believe that the Famicom (NES) version of Bomberman is the one and only version of the game." Shinichi is mistaken, of course. The PCE version of Bomberman was the one and only version of the game! Also, please help me verify if the Nakamoto Shinichi quoted in the article is this fellow. I'm confused. 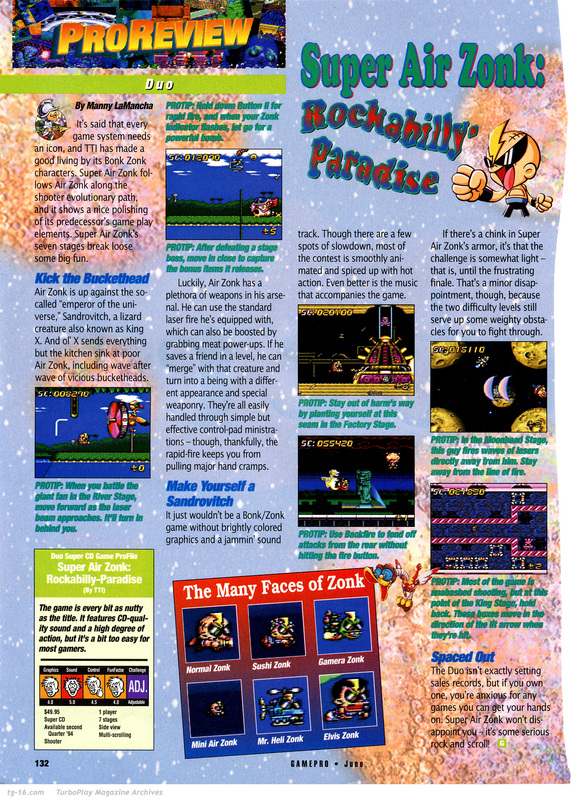 Super Air Zonk: Rockabilly Paradise (CD) Review (GamePro, 1994). Amusingly, the author paints Duo owners as desperate: "The Duo isn't exactly setting sales records, but if you own one, you're anxious for any games you can get your hands on. Super Air Zonk won't disappoint you—it's some serious rock and scroll." Oh, dear Lord. "Rock & Scroll" is an atrocious pun. 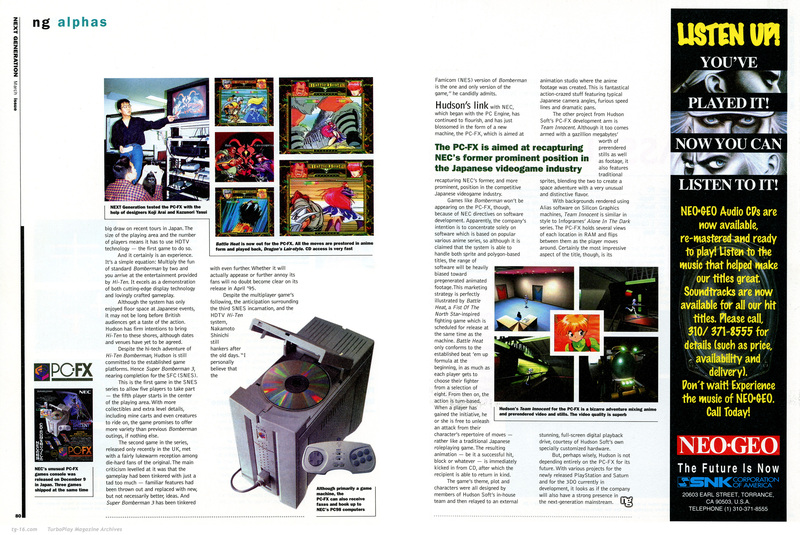 PC-FX and Bandai BA-X Hardware Preview (GamePro, 1994). Emphasis mine: "NEC plans on using the high-quality visuals, CD music support, CD movie-playing capability and Photo CD support to appeal to an older game-playing audience." Clearly, Photo CD was an integral, dare I say magical, component of NEC's strategy. As for the BA-X: "Bandai plans to create interactive video CD's that don't follow traditional video game design." 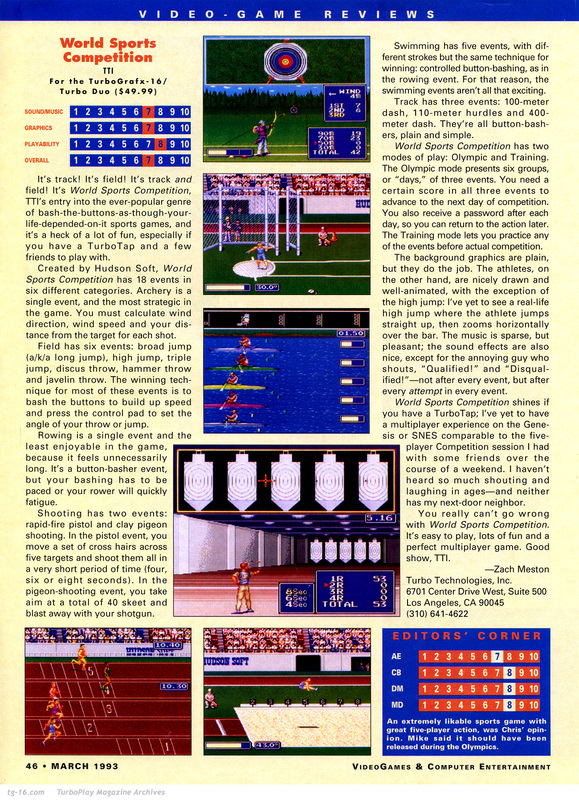 World Sports Competition (HuCard) Review (VG&CE, 1993). Barring Konami's Track & Field, I've never found this sort of game to be terribly interesting. If I ever take the plunge and play it, perhaps I will see if archery holds my interest. 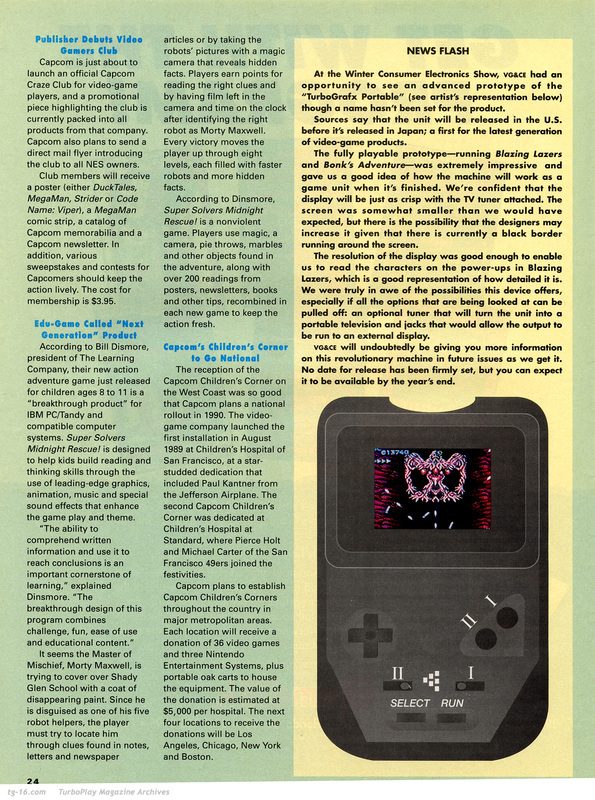 Bomberman II NES Review (VG&CE, 1993). Wait, did the reviewer just insult my beloved PCE Bomberman? That's cruel: "The graphics are blah, but they're clear, crisp and basically as good as the TG-16 version…" Ouch! 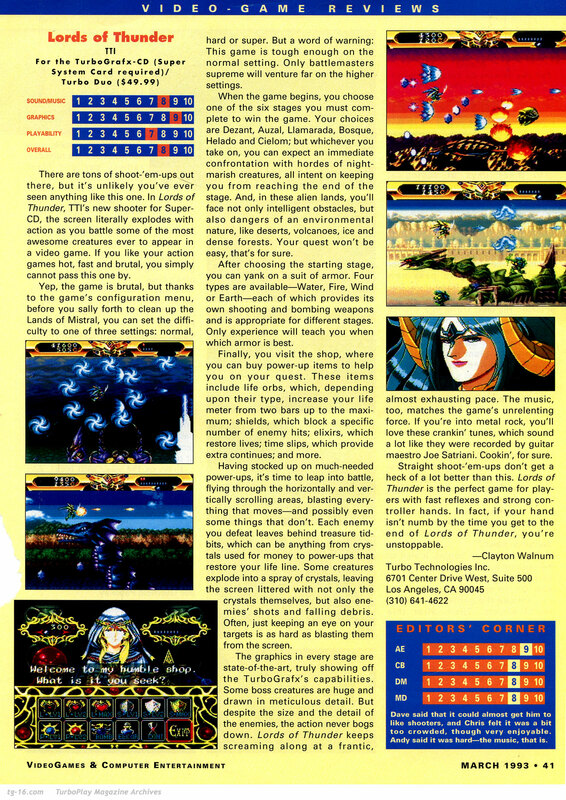 Lords of Thunder (CD) Review (VG&CE, 1993). Much love: "There are tons of shoot-'em-ups out there, but it's unlikely you've ever seen anything like this one." Forgotten Worlds & ICFTD Tip (VG&CE, 1993). TRIVIA: The Super Star Wars (SNES) tip was submitted to VG&CE via "the CompuServe on-line network"! TurboExpress Prototype (VG&CE, 1990). Winter Consumer Electronics Show (WCES): Check out the artist's representation of the "TurboGrafx Portable" prototype, which may launch in North America before Japan. Does anyone know if this, indeed, happened? Blazing Lazers Tip (VG&CE, 1990). FACT: You are not a bonafide shoot-em-up connoisseur if you haven't played Blazing Lazers on the God of Game difficulty setting. I'm serious. 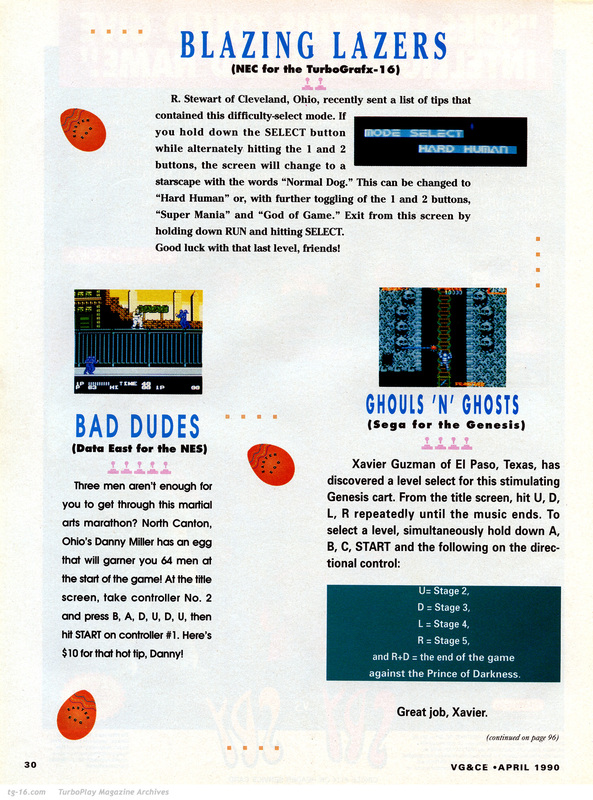 Legendary Axe 2-page Ad (VG&CE, 1990). I loved this advertisement so much that I wrote about it elsewhere on tg-16.com. Word up. If you can help in any way, please do so!